Devastating and traumatic accident cases require extraordinary legal representation. Any aviation accident requires a lawyer with extensive knowledge of the government regulations and agencies that oversee aviation safety on top of in-depth familiarity with personal injury law. It is critical to consult with a law firm that can handle cases both for injured passengers of aircraft and for property owners who have sustained damages and/or injuries from a crash. At Babbitt & Johnson P.A., in West Palm Beach, Florida, we handle aviation injury cases from around the country. Our attorneys have decades of experience at trial and one of our partners, Theodore Babbitt, has more than 4,500 hours of flight time as a licensed commercial pilot and flight instructor. Our firm knows aviation, and we can help you recover injury losses in this complicated area of law. Ted is instrument rated with certification from Flight Safety. He has flown volunteer flights as an “Angel,” helping sick people to get needed treatment, and he has done the same for “Pilots and Paws,” helping injured animals in the same way. 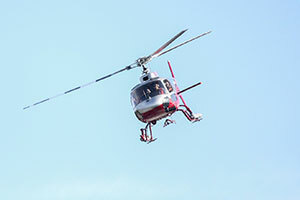 Injuries in helicopter accidents may result from defective parts, improper maintenance, negligent operation or negligence by another party on the ground or in the air. We fully investigate the circumstances of every aviation accident we work on and collaborate with experts to build the strongest case possible for our clients. We have the resources necessary to thoroughly prepare your case and prepare the strategy necessary for your best possible results in negotiation or litigation. We understand that injury and loss from a helicopter accident can be extremely traumatic. Our compassionate and attentive service is respectful of your wishes, and we keep you fully informed in order to help you make the decisions that fit your best interests. We represent helicopter accident victims throughout the United States. Contact our Florida helicopter accident lawyers today for a free case evaluation. Call us at (561)684-2500 or toll free at 1-888-666-0523.